Wing span: 1 1/4 - 1 15/16 inches (3.2 - 4.9 cm). 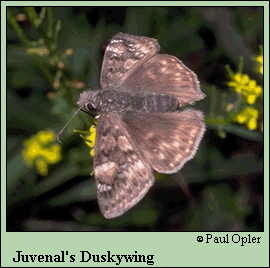 Identification: Upperside of male is brown with clear spots, indistinct dark markings, and scattered white hairs; female has larger markings and spots. Underside of hindwing has 2 round pale spots below the apex. Male has a costal fold containing yellow scent scales; female has a patch of scent scales on the 7th abdominal segment. Life history: To wait for females, males perch in forest clearings or edges on bare twigs about 3-12 feet above the ground; they will often patrol from these perches. Females lay eggs singly on young leaves and seedlings of the host plants. Caterpillars feed on leaves and rest in nests of rolled or tied leaves; fully-grown caterpillars hibernate. Flight: One brood from April-June, emerging as early as late January in peninsular Florida. Caterpillar hosts: Tree and shrub oaks (Quercus species). Adult food: Nectar from flowers of winter cress, dandelion, wild plum, wisteria, blueberry, Carolina vetch, redbud, and lilac. Habitat: Oak woods or scrub and associated edges or fields. Range: Nova Scotia and central New England west through southern Manitoba to the Dakotas and northeastern Wyoming; south through most of the eastern United States to Florida, the Gulf states, and Texas. White-fringed populations occur in west Texas, New Mexico, and central Arizona south to central Mexico.